Remember the two positive signs on the pregnancy test you took? Well my friend that is the ultimate confirmation that you are officially pregnant and are in your first trimester. Let me start by saying, Congratulations girl! You are growing a life inside of you and you should definitely feel blessed and grateful. On the other hand, being in your first trimester you will experience a few not so fun pregnancy symptoms. Yes, it’s true, the first trimester is the most feared and dreaded trimester of pregnancy out of the three. But, don’t worry mama, I’m here to help you survive the first trimester pf pregnancy, seriously! With my first pregnancy, I was lucky enough not to experience morning sickness, but with my second pregnancy which was with twins, I did in fact experience morning sickness. Even though I didn’t puke, I did have nausea and it was terrible. During your first trimester, you will go through so much more than just morning sickness. You will start feeling fatigue, have food aversions and just overall feel like you’re not yourself anymore. Been there! If you are pregnant for the second or third time around, then you already know what is to come. Which doesn’t make it any better, does it? Surviving the first trimester with kids can also have it’s challenges. But mama, there is good news! I’m going to share with you the super helpful ways to survive the first trimester of pregnancy. It helped me survive it twice and I’m sure it will help you too. Disclaimer: This article contains affiliated links for your convenience. You can read my disclosure here. During your first trimester of pregnancy, you’re going to feel very tired, this is also known as fatigue. Think about it, your body is going through so many changes to accommodate your growing baby. It’s totally normal to feel tired and blah. Know that it’s important for you to take this cue, and rest as much as you can. If you have little ones at home, put the t.v on for them and take a quick power nap. Your body needs it and you need it too. This pregnancy body pillow, will do wonders for you. I loved it and guess what? You’re going to use it throughout your entire pregnancy. If you haven’t experienced morning sickness by now, you’re in luck! But if you already have morning sickness, these items will help you ease it tremendously. Morning sickness is no joke, so you need to find ways to help you survive it. The minute that I found out I was pregnant for the first time, I started putting soda crackers and ginger ale soda on my night stand, just in case. So it doesn’t hurt to stock up on these morning sickness remedies before hand, even if you think you might not have it. Make sure you are eating a healthy balanced meal during your pregnancy. I know I know, this may sound horrific if you’re suffering from morning sickness, but It’s very important mama. You need to eat for you and your baby, so try eating small but frequent meals throughout the day. Make sure you eat food that does not make you want to gag, if you want an apple eat an apple, if you are craving a biscuit, then have biscuit. You need to eat something and it’s even better to eat food that does not make you want to vomit. Did you know that dehydration can be a culprit of morning sickness? Yes! So, please stay hydrated by drinking plenty of water! If the thought of water makes you sick, try drinking Gatorade, it keeps you hydrated and it’s tasty! A great way to survive the first trimester is to feel comfortable and relaxed. Wearing tight clothes may make you feel like you can’t breathe and can make you feel very uncomfortable. Try your best to wear loose fitted clothes and you will see how awesome you will feel. Check out this helpful pregnancy clothing guide. Sometimes, you just gotta let things go. Do not worry about your house being clean or folding your clean laundry, it can wait. Please do not put so much pressure on yourself to get things done right now. Right now, you’re in your first trimester (the worst trimester of all time) and you need to take it easy. Trust me. Guess what? You do not need to cook, if the thought of cooking and smelling food makes you want to gag, just order in. That’s what I did during the first trimester of my twin pregnancy. No shame in my game! Along with letting some things go, how about cutting down on your commitments. Now, I do not mean skipping your best friends wedding, but I do mean, saying no to hanging out with friends if you just feel miserable. They will understand. You can even be under the radar for a bit, you don’t need to attend every event you have been invited to. Just narrow down the important people in your life that matters and try attending to their events. Skip play-dates if you have to, cancel the bake sale you said you were going to do. It’s time to think about what’s more important here, and that is you and your baby’s well being. It’s going to be okay. If you find yourself experiencing severe morning sickness or fatigue, I think it’s time to pay your doctor a visit. He or she will definitely help you feel so much better and may even prescribe you pills to help with your morning sickness. Remember to always talk to your doctor about any unusual symptoms you may be feeling and any concerns you may be having. They are there to help you! 9. This too shall pass? I love having a positive mindset because it helps me keep pushing through. Remember that not everything lasts forever, if you’re experiencing morning sickness, remember that the second trimester is around the corner. Many women who suffered from morning sickness during their first trimester, do not experience it during their second or third trimester. Hopefully for you, it’s not an all day, all pregnancy morning sickness. Remember that the first trimester will also pass and you will start feeling like yourself again. Stay positive mama. You know what I used to do when I would feel miserable with my first and second pregnancy? I would always look at my sonogram pictures and everything just felt so much better. I would instantly have a smile on my face when I would look at my precious babies, it was amazing. If everything else fails, just remember that you’re going through all of this because you’re growing a little miracle inside of you. Think about your baby and know that everything will be all worth it at the end. You are blessed. You’re well into your first trimester and want to find ways to survive it! I hear you girl, I’ve been there twice! The first trimester of pregnancy is literally the worst one in my opinion for many reasons. You start experiencing fatigue, have food aversions and may even suffer from morning sickness. That’s a lot to deal with, all while you’re trying to feel happy about your pregnancy. Are you ready to conquer the first trimester? You totally can by following the tips mentioned above. 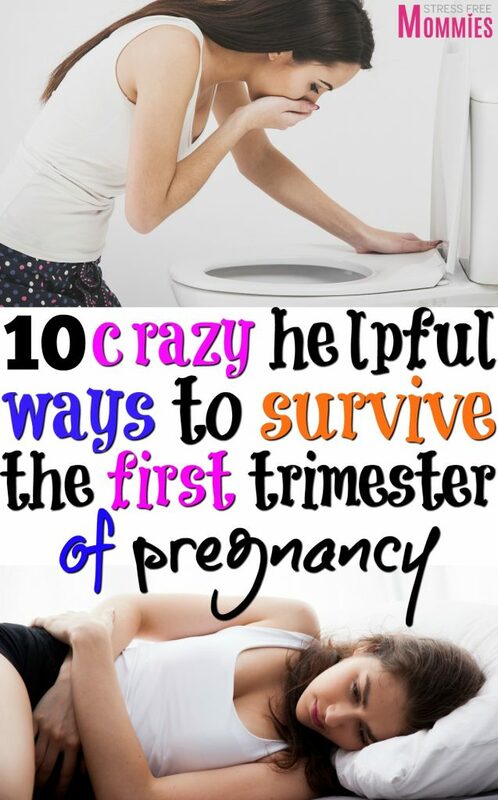 I hope you found this article helpful in surviving the first trimester of pregnancy. Morning sickness is for REAL!!! You are lucky that your experience was mild. I had morning sickness not just in my first trimester, but throughout my ENTIRE pregnancy! And I had it BAD! I mean, there were some days when I couldn’t even get out of bed for fear of throwing up, and days when I threw up as many as 7 times! I often wondered how my baby could possibly grow when I was throwing up everything I ate! I tried every remedy and nothing helped. But honoring your cravings is a good way to go, because at least you are getting something in your system and your tip for eating smaller frequent meals is on point as well. I often craved plain bagels, fried eggs, kiwis, and tangerines. During my second pregnancy, I craved Starbucks Frappuccinos every day! Yes, it was caffeine and sugar, but hey, there’s milk in there too! Regardless, my babies were BIG (9 lbs. and 9.12 lbs. respectively) and super healthy, so don’t stress too much if you can’t hold stuff down. Just keep trying different things to see what will stick and try to make the healthiest choices you can. Yes! These are great! I love 9 & 10 especially! Sometimes they’re the only reason you can make it through! Yes apple sauce! Thank you! I appreciate not only the tips but the encouragement and positive thoughts you send most posts are great but it makes a diffeeence when you dont feel great and i sent this to my daughter who is in her 1st trimester with horrible morni g sickness and i came across your post and i am grateful for it. Thank you so much! I hope your daughter can get through it quickly and stars feeling better!